More Product InfoIf you are looking for a reliable keystone jack that offers a toolless installation process, the team at CableWholesale is here to help. 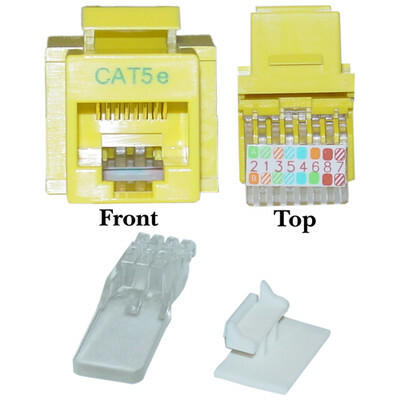 With our Yellow Cat5e RJ45 Keystone Jack you will be able to easily transition from 110 type punch to Cat5e connections. Simply compress the plastic cover onto your wires and you will be good to go. This jack works in any environment with our patch panels, mount boxes, and wall plates, and it even exceeds the EIA/TIA-568-C standard. Better yet, its gold connectors protect against corrosion, and it even has pure copper conductors for increased signal strength. If you would like to learn more about this keystone jack, you can get in touch with CableWholesale today!